PACKING an LS7 7.0 litre alloy V8 engine, hydroformed lightweight body structure, carbonfibre panels and race-bred suspension, the Chevrolet Corvette Z06 is the fastest production car General Motors has ever made. 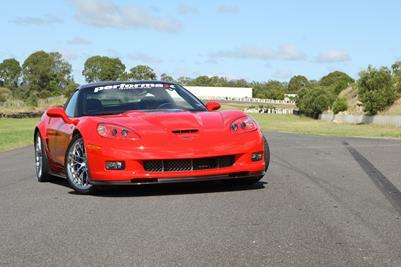 The Chev Corvette Z06, manufactured only in left-hand drive in Bowling Green, Kentucky, undergoes a seamless conversion for right-hand drive Australian roads at Performax International. CHEVY'S Corvette Z06, the ultimate race-bred development in a family line of iconic American sports cars stretching back 54 years, is now on sale new in Australia. Coupe, 2-seats, composite and carbon-fibre body panels, hydroformed aluminium frame with aluminium and magnesium structural and chassis components. The fastest roadgoing Chevrolet Corvette ever built, the 320 kmh supercharged ZR1, will be a star attraction at the 22nd National Corvette Convention in Perth over Easter.